Chandler Gilbert Arc, in partnership with Maricopa Association of Governments (MAG) and the City of Phoenix, provides Mobility Management services to individuals throughout the Phoenix East Valley area under the Section 5310 Coordinated Mobility Program (Elderly and Persons with Disabilities Program). Learn more about Mobility Management! Chandler Gilbert Arc provides a full range of programs and services to adults with developmental disabilities. There are many ways you can get involved with Chandler Gilbert Arc to help make a difference through our various events and volunteer opportunities! Chandler Gilbert Arc is a private, nonprofit organization dedicated to providing teaching and support to individuals with intellectual and developmental disabilities. 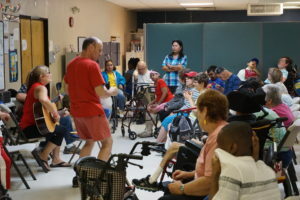 First conceived in 1975 as “Chandler Arc”, by a group of parents who wanted to provide life options for their (8) adult children with disabilities, CGArc now proudly serves over 500 individuals per year with specialized community-based employment, housing, and adult day programs. Chandler Gilbert Arc is licensed and funded by the State of Arizona Department of Economic Security Division of Developmental Disabilities and State of Arizona Rehabilitation Services Administration and other private funding sources. At the national level, we are affiliated with The Arc of the United States. At the state level, we are affiliated with The Arc of Arizona.